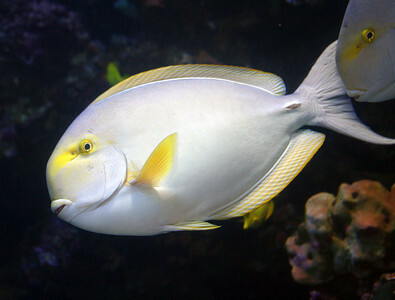 This gallery includes images of fish and other marine life, insects, reptiles, and land mammals. 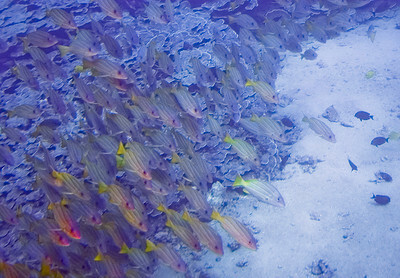 An unidentified Surgeon Fish, Molokini Crater, south Maui. 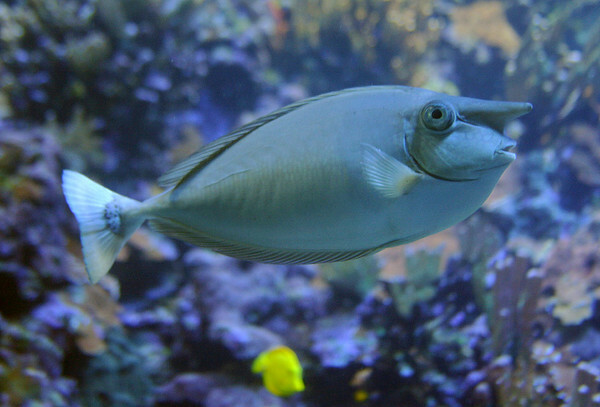 The surgeonfishes have all sorts of juvenile and pre-adult stages that have all manner of colorations very dissimilar from mature adults, making it difficult to identify them. 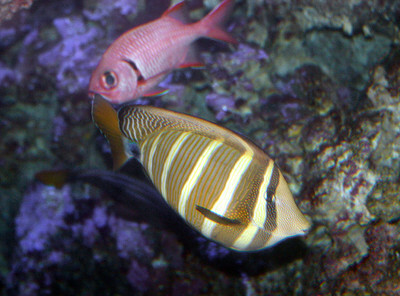 Sailfin Tang (Zebrasoma veliforum) in the foreground, being shadowed by an Epaulette Soldierfish (Myripristis kuntee). Manele Bay, Lana'i. 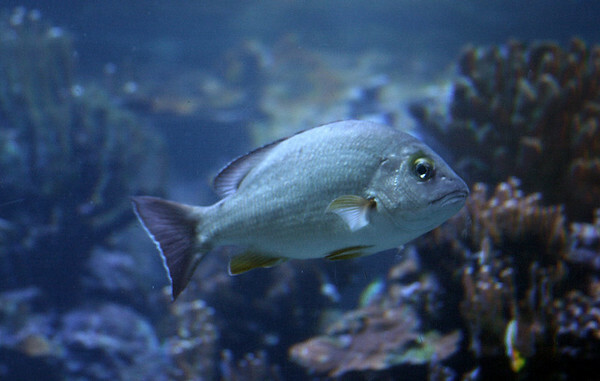 A Blacktail Snapper obligingly offers the camera its good side. The wall dive, near Shark Fin rock, Palaoa Point, southwest coast of Lana'i. 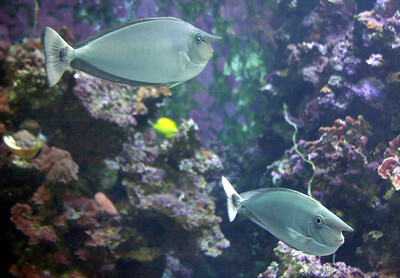 Whitemargin Unicornfish, Maui Ocean Center. 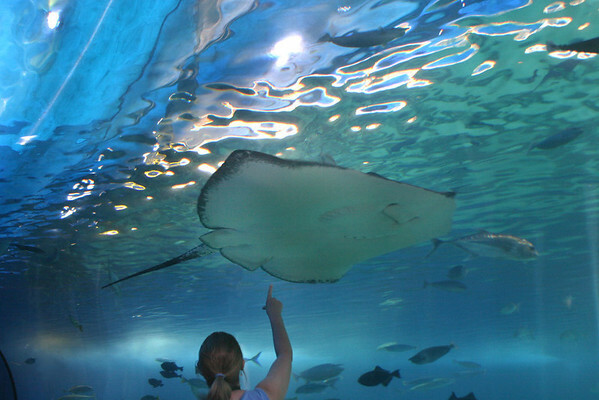 Female Brown Stingray (Dasyatis latus) slowly cruising over the perspex observation "tube", Maui Ocean Center aquarium. 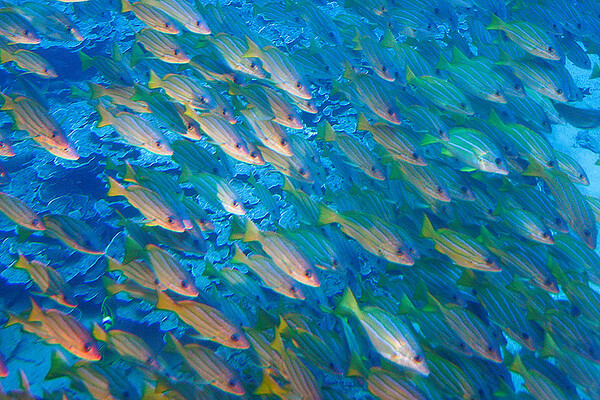 A school of Bluestripe Snappers (Lutjanus kasmira; also known as the Bluestripe Sea Perch and the Blue-line Snapper) is a common species of marine fish of the snapper family Lutjanidae. Lahaina, Maui. 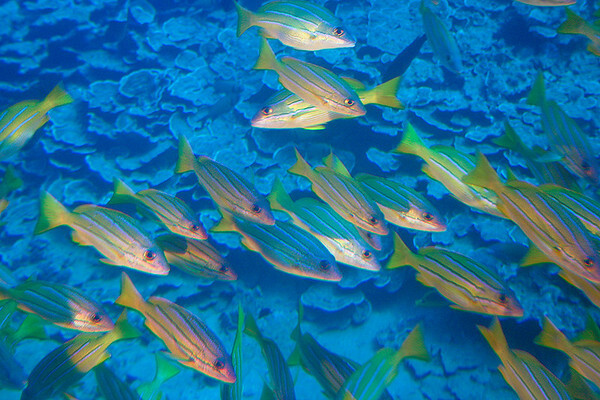 The Bonefish (Albula vulpes) is the type species of the Albulidae family, or bonefishes in order Albuliformes. It is "amphidromous", living in inshore tropical waters, moving onto shallow mudflats to feed with the incoming tide, and retreating to deeper water as the tide ebbs. 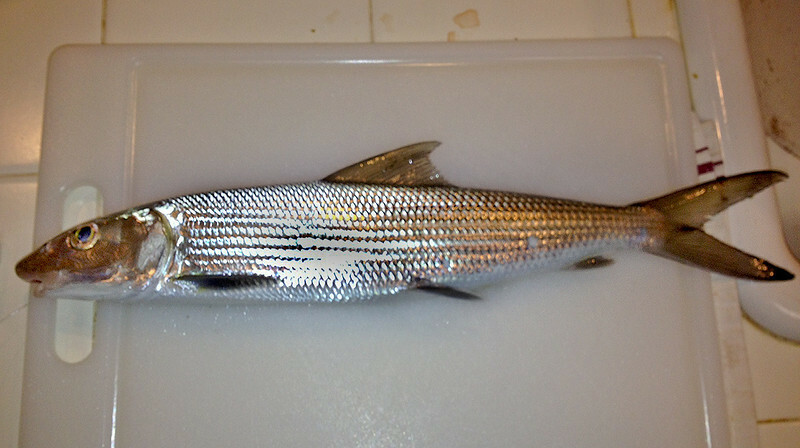 Caught off Kalepolepo Beach, Kihei, south Maui. About 20 inches long. 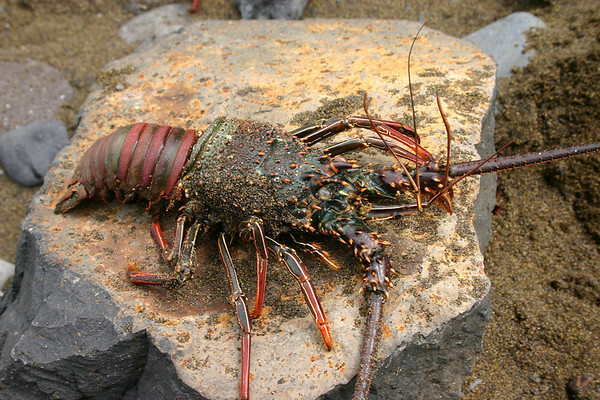 Banded Spiny Lobster (Panulirus marginatus), caught at Honomanu Bay, east Maui. 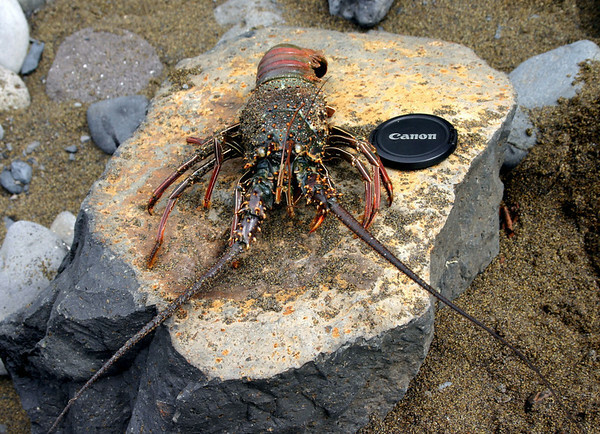 Banded Spiny Lobster (Panulirus marginatus) caught at Honomanu Bay, east Maui. 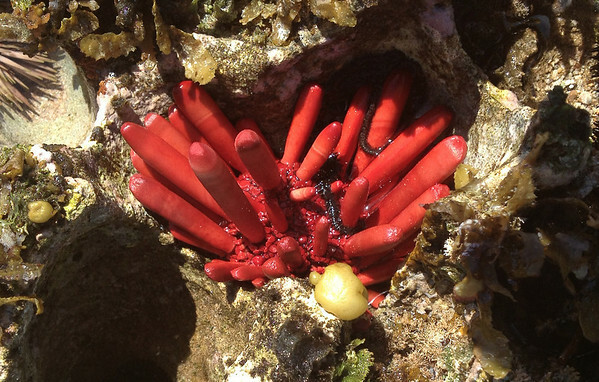 This species is endemic to the Hawaiian Islands. 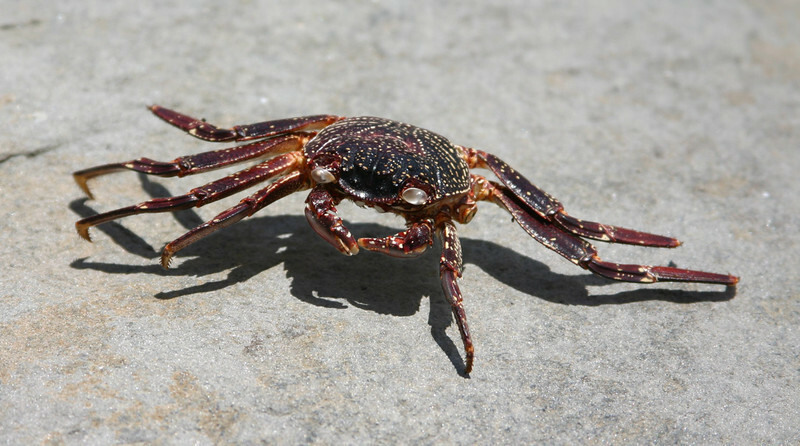 They do NOT have large pincers (claws) on their forelegs like their North American cousins. However, they are quite large, carnivorous, and highly prized by local divers. Amputee Sand Crab, D.T. Flemming Beach Park, West Maui. 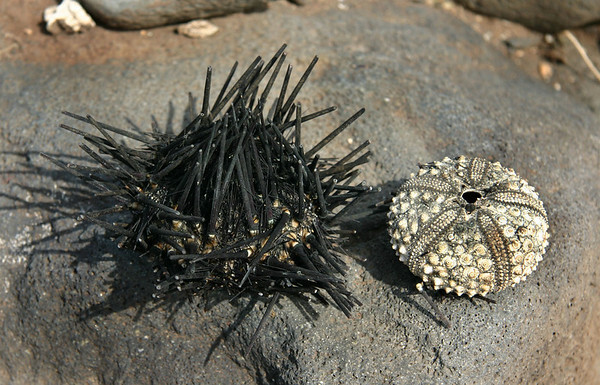 A Black Sea Urchin (Centrostephanus rodgersii) with its spines intact (bleached spineless test on the right for comparison), Ukumehame, West maui. 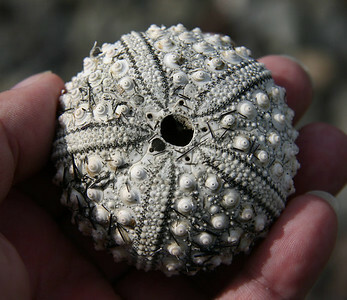 The calcareous remains (known as the "test") of one of about 50 Black Sea Urchins (Centrostephanus rodgersii) I found washed up high onto the rocky shoreline of a beach near Ukumehame. 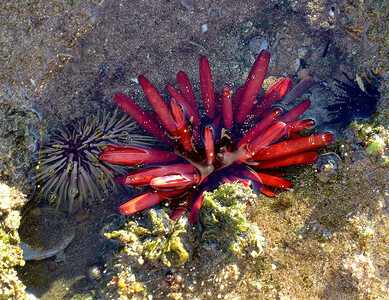 This one had most of its spines scrubbed off in the surf. Considering how delicate the test is without living tissue to hold it together, it's amazing that it's still intact. 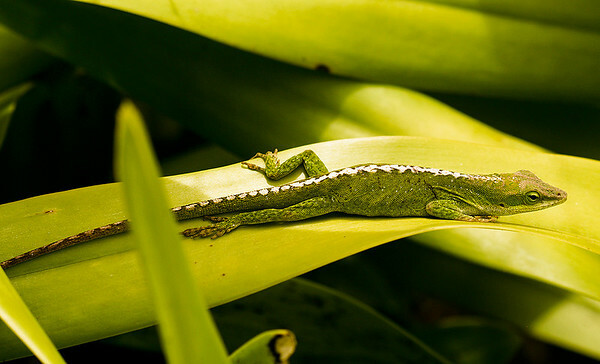 A female Green Anole (Anolis carolinensis) resting among a dense patch of bromeliads. Ulupalakua, south Maui. 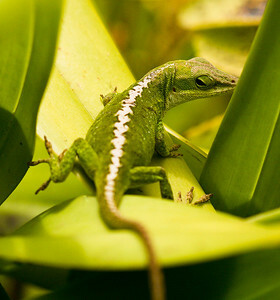 Anoles' diets include live insects and other invertebrates, with crickets, spiders, and moths. 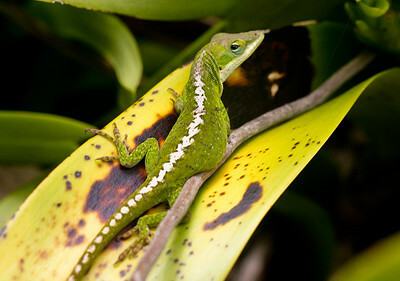 Anoles have many readily identifiable features. They have dewlaps, made of erectile cartilage, that extend from their neck/throat areas. Their toes are covered with structures that allow them to cling to many different surfaces. Also, their tails have the ability to break off at special segments to escape predators or fights. The tail continues to wriggle strongly for some minutes after detaching. This ability is known as autotomy. 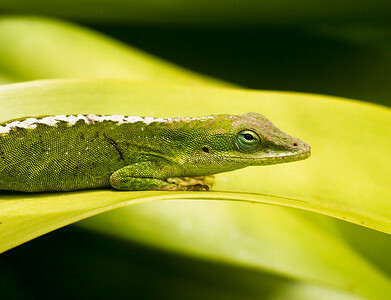 Anoles are also diurnal - active during the daytime. Some species of anoles exhibit sexual dimorphism, which allows one to discern between males and females fairly easily with the naked eye. 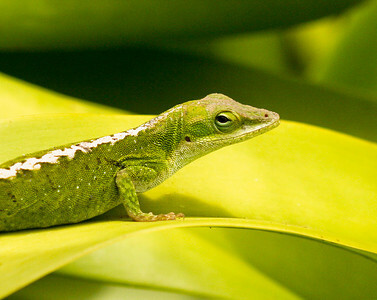 In green anoles, the female is characterized by a pale dorsal stripe extending from the neck to the tail, a generally smaller body, and a smaller head with a shorter snout. 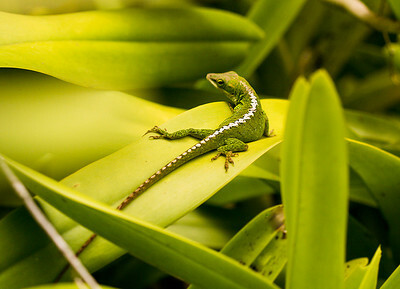 Several genera of Anoles are present on Maui.